Thanks to a little birdie called Xylvie, I got to know about the Mortal Engine contest hosted by 8 days magazine. The prize ? A trip to London for 2 to catch the premier of the movie. So I got Hanyang from Funbie Studios to take part as well to double our chances of winning. And boy did he step up with his 3d printed city. You can check out his entry here! Here’s my entry for the contest! Mega E.R.P. Gantry Alliance. (M.E.G.A.) lol. For those who followed my ig stories, I know I mentioned coloring up this big guy over ig live. Unfortunately I couldn’t find the time to set up the camera and I was rushing to meet the deadline. Also, I thought that the line art should stand out and so I shaded in a monotone of faded red. I figured it might not be as interesting to watch. I’ll try to find something else to do live next time! More about this version of traction city. So the idea is that in the distant future, we will be self sufficient in NEWater. However, we need other resources, so we become a tax city of sorts. MBS lasers will seek out passing traction cities and we’ll tax them in the resources we require. In return, we might provide some aid relief in NEWater if necessary. A closer look at all the untidiness. Can you spot my signature? Definitely bringing HDBs on board because we need a place to house the remaining population and to continue the tradition of hanging our clothes and undies out to dry :) There’s the Art Science museum that contains all the remnants of our past. This crabby is not happy. For that Work - Life balance, we brought some office spaces for inhabitants to work in. Nothing special about the buildings except they are built on this GIANT MUTATED CRAB! This was just a brain fart, when I thought that we could weaponise our food. The Crab is mechanically engineered to catch passing cities if they were to evade the gantry. Funnily enough, it does seem to be flipping the bird in this pose. Derpy Merlion spitting watermelon seeds. 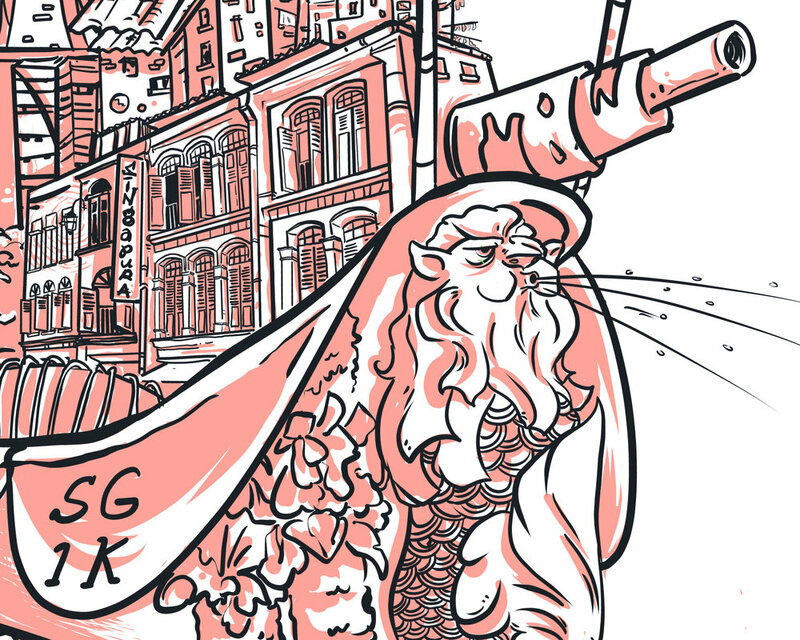 Shop Houses and Derpy Merlion. With work places and homes settled, we needed a space to play. Then there’s the matter of preserving our heritage. The solution ? Shophouses with hipster bars, restaurants and kopitiams. (Such win!) Derpy Merlion had to be a figure head for the city. Backed by a large canon, it’s been programmed to spit watermelon seeds at smaller scrap cities when we engage in close combat. Trainer wheels are nothing to be ashamed of! Banner beautification and Trainer Wheels. Along with the banners that line the sides, we wrap the city up with flower garlands for the fresh look and smell. Though most cities move on larger wheels, we have underbelly wheelies and trainer wheels that are retractable. In the event we get to sea or a desert terrain, navigation is simpler by controlling the sails and letting the wind do the work. A BIG thank you to you if you made it to here! This was a good exercise and I wanted to properly share the features I’ve included in this piece. I’m pretty sure my traction city won’t work out irl but it is purely how I imagine it to be. Oh and I used Clip Studio Paint for this piece, as with most of my digital works :) Feel free to shoot me questions about my process or materials. You can email me or leave a comment below. I’m most happy to share!